It’s time for another installment of the Noble Grape Challenge. Last episode we jumped into the world of Sangiovese, and today we stay a little while longer in Italy to get to know the Nebbiolo. First of all, can we just take a second to appreciate the name, Nebbiolo? Say it with me now – nnnnnneeebiooooooooolooooooo. So good. Nebbiolos are most commonly from the Piedmont region in Italy. But what we do we know about Italy? They like to blend! So, Nebbiolo is commonly used in blends like Barolo, one of the more famous Italian wines out there. Also, I find it interesting that Nebbiolo is considered a noble grape when other regions have had trouble creating high quality wines from it – but I guess being noble is about how great the wine is, not how easy the grapes are to grow. To try out Nebbiolo I tasted Enrico Serafino Barbaresco. I’ve never had a Nebbiolo before, so this is a complete adventure for me. 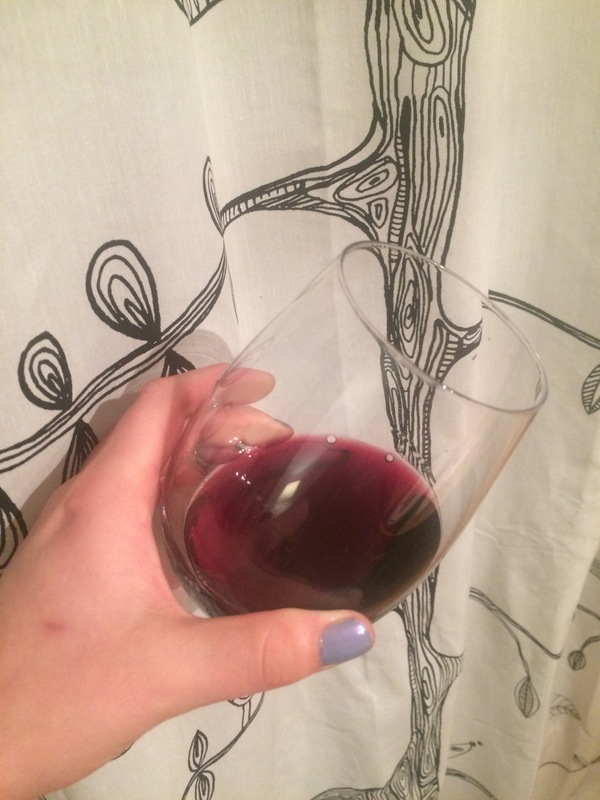 I’ll have to use the other things I know about wine, along with the research I’ve done, and trust my palate and my own tastes, which is what you should do every time you taste too. My first observation: wow, is this ever light in colour! You can see the entire glass under the wine! This wine is super transparent, which isn’t something I usually see outside of a Pinot Noir, though, to be honest, I tend to favour big reds that often look like ink in my glass. This wine also looks a little brownish at the edges, which isn’t surprising considering the only Nebbiolo I could find was from 2010, and wines start to get some brown in colour as they age, especially around the edges. The wine had been in the glass for a while before I got to smell or drink it, and I’m happy it had a chance to open up. I found the nose to be earthy, with a bit of spice and some vanilla. Overall very soft and smooth. I found the flavour pretty similar to the nose – smooth, spicy on the finish, with some tang/tannin/acidity, which is a common neb trait. I also found it quite big and full-bodied, which isn’t surprising knowing that Nebbiolos are common players in a Barolo, but was surprising given how lightly coloured the wine is. This wine is definitely keeping me on my toes. I was disappointed not to get any smoke from this particular Nebbiolo, knowing that’s also a common trait. I love me a smoky wine. So, what do I think of this wine? I didn’t hate it, but I didn’t love it either. I drank it over a few nights and was disappointed that it didn’t mellow much over that time – I think I was hoping the tannins would settle down, which they didn’t. I liked the full body in the flavour but the acidity got in the way of true enjoyment. If I’m going to buy a big red I’ll steer more toward something from Chile or Argentina. That being said, if you like Italian wine (and can afford $20 a bottle) then I would recommend this wine. I do want to note the cork. The wine had crept halfway up – wow! This is a often another sign of age, or sometimes of a bad seal. 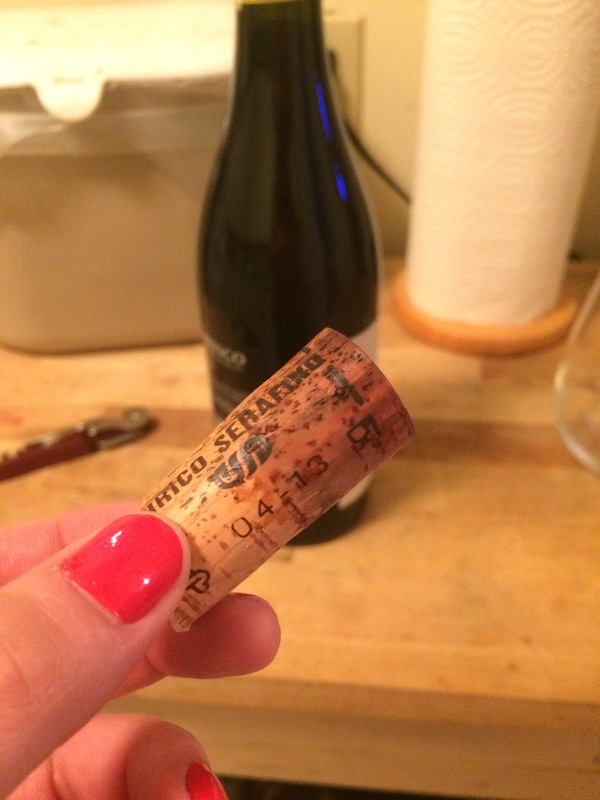 I’m happy this bottle found its way to me before the wine crept all the way up, since it would have meant the end of the cork and therefore the end of the wine. Luckily I managed to save it first and give it a good home. Are you familiar with Nebbiolo? What do you think of it? Next up – Tempranillo! Olè! It’s time for another installment of the Noble Grape Challenge. Last episode we got to know Merlot, and today we’ll get acquainted with that old Italian grape, Sangiovese. 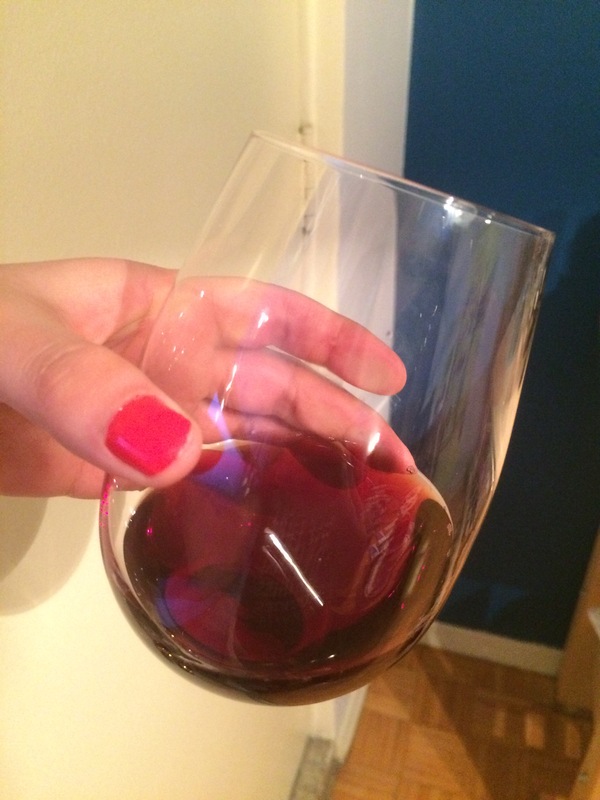 Before we talk about the wine, let’s talk about the word – Sangiovese. It doesn’t look English, does it? In fact, you might think it looks straight-up Italian – and you would be right. This is your first clue that Sangiovese is a special varietal. Sangiovese is really only grown in Italy. It’s one of the few varietals that is so scarce beyond its ‘home’ location. But! Before you go feeling all sorry for the little Sangiovese grape, let me tell you that there’s actually a big variety of it within Italy, which means its bouquet and flavour can vary quite a bit depending where in Italy it’s found. That’s the second clue that the Sangiovese varietal is a special one. To try out Sangiovese I tasted Farnese Fantini Sangiovese IGT. Very New World style label – I like! As you can see, it colour is pretty gentle. It’s not super clear like a Pinot, nor is it completely opaque like a Malbec. It’s got a nice red colour and is a little orange-y along the edge, which I’ve read is a typical marker of a Sangiovese. I found it difficult to get much off the nose of this wine, which I always find disappointing. After I left it in my glass for a while (almost an hour!) I started to smell some candied fruit, and a bit of cookie, actually. You know the classic vanilla Girl Guide cookies? I smelled those. Weird, I know. The flavour was quite full. I got a fair amount of fruit (cherry, I think) off the top and a bunch of oak on the finish. In fact, the aftertaste was a bit like lickin a tree. Jury’s still out on that sensation. Despite being disappointed by the nose I quite like this wine. It goes down easy, and might just be my next go-to pick for a party or dinner with a friend. And, the best part, it was under $8! I was wary of the price and but decided to take a chance, and I’m glad it paid off. Have you tried Sangiovese lately? What did you think? 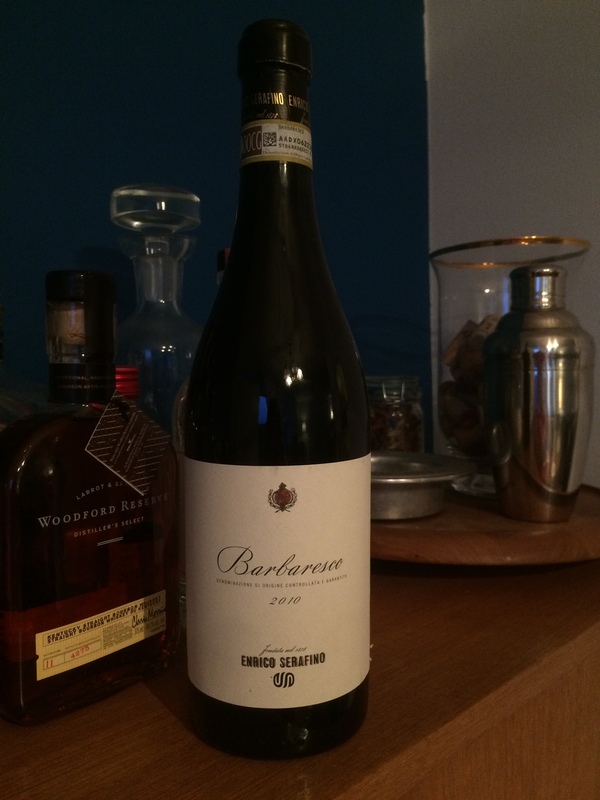 Next up in the NGC: Nebbiolo – if I can find it!